Rob Lake a very successful magician has incredibly made an armored truck just appear out of thin air on a stage, the event took place on 29th March in front of the FedExForum. Caesars Entertainment sponsored the trick as part of its Millionaire Makers promotion. Every week during April and still to be determined date into the future, Harrah’s Tunica, Tunica Roadhouse, and Horseshoe Casino are giving away $1 million to a player. You can view the stage and trick below, not a trick that most people can perform at home, but a great display of how anything can be achieved. Learn how to entertain with just three cups & a few balls! Easy to learn routines and vanishes. 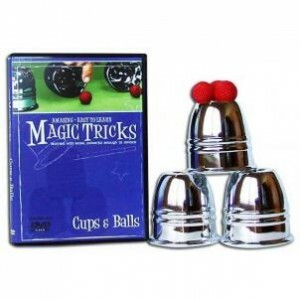 A set of plastic chrome cups & magic balls comes with the DVD. Collect the series! Start honing your skills today with the bottle cap through the glass bottle trick!! !